Matheus Diniz became KASAI Pro middleweight champion after winning the tournament without conceding a single point. The Alliance black belt– who trains at Marcelo Garcia’s academy in Manhattan– used a combination of aggressive wrestling and a strong top game to steamroll the opposition. 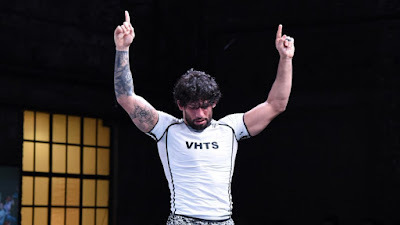 Diniz, who hails from the state of Minas Gerais in Brazil, defeated 10th Planet black belt Richie Martinez in his opening match, outpointing him 7-0 via a guard pass and mount. In his second match Diniz defeated fellow Brazilian Felipe Mota 2-0, before submitting Tristar / Renzo Gracie team member Pierre-Olivier Leclerc with a choke. The final saw Diniz pitted against Atos standout Mike Perez. Diniz outscored Perez 2-0 in a match.